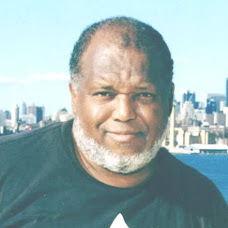 BIGGAFF'S VERSION OF THE TRUTH: FRANK MICKENS - "BLACK AUERBACH"
FRANK MICKENS - "BLACK AUERBACH"
Frank Mickens -A Living Legend in NYC education IS RETIRING AFTER 36 YEARS ON THE FRONTLINES! **Ran the tightest ship in the modern day Board of Education H. S. annals. **Was an accomplished H. S. hoops coach, before becoming Principal at Boy's & Girls-winning the N.Y. City Championship in early 70's. **I Will never forget first time I met him at hoops clinic-he was giving a talk to assembled h.s. & youth coaches when at end of clinic someone asked him.---->>>>>"Coach Mickens- given the reputation of Boy's H.S / Bed/Stuy. for being the home of so many great players-what criteria do you use to pick a team?" "Noooooooo Bumssssss - NOOO BUMMMSS!" ** He went on to tell the startled but impressed audience that he would never accept any knuckleheads with attitudes on his team. If you ever saw his teams play & how they conducted themselves-you knew he was a man of his word. Frank will be missed, but never forgotten- a great coach, a great educational leader & simply a GREAT man. FRANK IS A FINE MAN AND A GREAT COACH, BUT HE ONCE TOOK A "BUM"ON HIS TEAM. WHILE SERVING AS HIS JUNIOR VARSITY COACH, I THOUGHT HE ONCE WENT TOO FAR WITH A KID WHO HAD DRUG PROBLEMS -- BUT I WAS ONLY THERE AFTER SCHOOL HOURS AND THERE IS ALWAYS A THIN LINE ABOUT HOW FAR YOU SHOULD GO TO HELP A KID, BEFORE YOU ARE BEING PLAYED FOR A CHUMP OR WASTING YOUR TIME. FRANK WAS TRYING TO PROP THIS KID UP AND THE KID SEEMED, TO ME, TO SLIP BACKWARD FAR TOO OFTEN -- BUT FRANK IS A BULLDOG AND HE WAS TRYING TO SAVE A SOUL AND HOW CAN YOU KNOCK HIM FOR THAT - AND HE KNEW PERSONAL AND FAMILY DETAILS I HAD NO KNOWLEDGE OF AT ALL - FRANK SAW SOMETHING IN THE KID, I MISSED. HE WAS LOOKING BEYOND BASKETBALL. THAT IS PART OF THE GREATNESS OF SPORTS - I WOULD HAVE WRITTEN THIS KID OFF FROM DAY ONE AND FRANK DID ALL HE COULD TO WORK WITH THE YOUNG MAN -- I WONDER HOW THE KID TURNED OUT - I KNOW HE HAS TO BE BETTER OFF FROM ASSOCIATING WITH FRANK, WE ALL ARE. FRANK WAS TRUE TO HIS WORD - EVERY KID WAS RESPECTFUL AND A GENTLEMEN ON HIS TEAMS - HE KNEW ABOUT CLASS & CHARACTER AND RECOGNIZED, APPRECIATED, ENCOURAGED AND NURTURED CHARACTER IN HIS PLAYERS AT BOYS HIGH. IN THE MOVIE, THE CAINE MUTINY, A SAILOR IS ON TRIAL FOR THE CAPITAL CHARGE OF MUTINY IN TIME OF WAR. THE DEFENSE LAWYER HAS BEEN CROSS EXAMINING THE CAPTAIN IN A VERY HARSH TONE AND RAISING QUESTIONS ABOUT HIS ACTIONS IN TIMES OF DIRECT COMBAT WITH THE ENEMY. THE COURT MARTIAL JUDGE WARNS THE LAWYER THAT THERE IS NO GREATER CHARGE TO BRING AGAINST A NAVAL CAPTAIN, THAN COWARDICE UNDER FIRE. THE LAWYER, STOPPED EVERYTHING AND TOLD THE JUDGE AND TRIAL BOARD, ALL OF THEM, NAVAL CAPTAINS THEMSELVES, THAT HE NEVER MEANT TO IMPLY THE CAPTAIN WAS A COWARD AND FURTHERMORE, HE DID NOT THINK IT WAS POSSIBLE FOR ANYONE WHO WAS A COWARD TO ACHIEVE THE RANK OF CAPTAIN IN THE UNITED STATES NAVY. THE LAWYER WENT ON TO WIN THE CASE. MY POINT IS -- NO KID IS A BUM OR COULD BE A BUM, IF HE OR SHE IS UNDER THE MENTORSHIP / COACHING OF FRANK MICKENS - FRANK HAS SET A STANDARD THAT WON'T BE EQUALLED AND CANNOT BE SURPASSED, IN THE AREA OF GIVING KIDS A SHOT AT A BETTER LIFE THAN THEY COULD HAVE EXPERIENCED WITHOUT HIS PARTICIPATION IN AND DEVOTION TO, THEIR EDUCATION AND WELL-BEING. I SEE ALL THE ACCOLADES GIVEN FRANK, AS BEING SHARED WITH HIS DAD, WHO SPOKE VOLUMES, WITHOUT EVER SAYING A WORD -- I WORKED WITH PHIL FORD, SENIOR AND BOTH THESE DAD'S OF OUTSTANDING SONS , HAD SIMILAR PERSONAS - A QUIET STRENGTH OF CHARACTER. OF COURSE, FRANK DID NOT INHERIT THE QUIET ELEMENT.